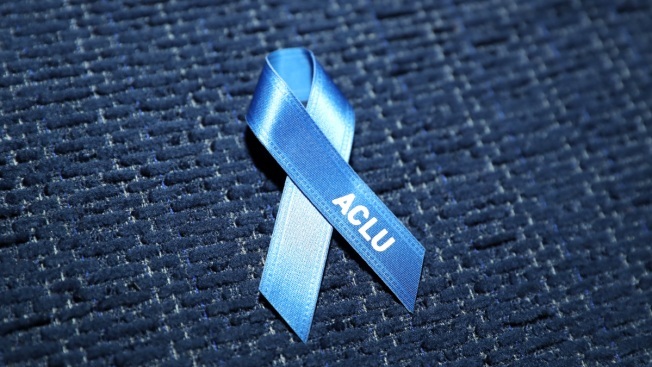 In this Feb. 22, 2017, file photo, an ACLU pin is seen in Los Angeles, California. The U.S. has released a dual American-Saudi citizen who was suspected of working with the Islamic State and detained by the U.S. military for more than a year without charge, the American Civil Liberties Union said Monday. The ACLU said the identity of the man and the country where he was released are protected by a court order to ensure the safety of him and his family. The New York Times, citing unnamed U.S. officials, said the man was released in Bahrain. The man, who is married and has a young daughter, once lived and studied in Louisiana. His release followed months of legal wrangling between government lawyers and the ACLU. It has been a test case for how the government should treat U.S. citizens picked up on the battlefield and accused of fighting with ISIS militants. "This is a victory our client fought for long and hard. The victory sends a strong message that the president cannot take away an American's liberty without due process, and it shows the continuing importance of judicial review," said his ACLU attorney, Jonathan Hafetz. The ACLU has argued since October 2017 that the government should either charge or release the man. Negotiations for releasing him began after the ACLU filed an emergency request in June to block the government's plan to release him in war-torn Syria. "When I fled violence in Syria, I never imagined that my country would deny me access to a lawyer for nearly four months and imprison me without charge in solitary confinement for over a year," the detainee said in a statement released by the ACLU. "No one — no matter what they are suspected of — should be treated the way my government treated me. Once I got the chance to stand up for my rights, the Constitution and the courts protected me." The man, who was detained in Iraq, told his attorneys that he wished to remain anonymous so that he could rebuild his life. U.S. government officials did not respond to several requests seeking comment. The government argued in court it could detain the citizen under the 2001 Authorization for Use of Military Force, which Congress passed after 9/11. The ACLU, however, argued that those war powers pertain to al-Qaida and the Taliban and don't apply in the battle against ISIS. In defense of the detention, U.S. authorities said that when the man surrendered in mid-September to U.S.-backed Syrian Democratic Forces, he was carrying thumb drives containing thousands of files. There were 10,000 or more photos — some depicting pages of military-style manuals. There were files on how to make specific types of improvised explosive devices and bombs. The detainee said he had press credentials to do freelance writing about the conflict in Syria, although the FBI hasn't found any published articles or blogs he authored. Court documents offered other details about his background. An individual who met the detainee in July 2005 in New Orleans, where he was studying, told the FBI that he was a "wild and typical" college student, who drank and used marijuana and gambled at Harrah's casino in the city. The associate said the man lived briefly during 2005 or 2006 in Covington, Louisiana, where he frequented casinos and strip clubs. After an argument with friends about not repaying money he used to gamble, the detainee left the United States for Saudi Arabia. Between 2006 and 2014 the detainee got married and lived in Saudi Arabia and Bahrain, working in various family businesses, including a women's tailoring shop and a construction company. While his wife was pregnant, he traveled on business to Indonesia, Singapore, China and Malaysia. While in Asia, the government said, the detainee tweeted pro-ISIS messages. The associate from New Orleans said the man stayed with him briefly in the summer of 2014 when he tried unsuccessfully to get a U.S. passport for his daughter. He said the detainee returned with his wife and child on a second visit to New Orleans in late 2014. In early 2015, the detainee flew to Athens, Greece, and then to Gaziantep, Turkey, where he paid a smuggler $300 to get him into Syria. He arrived there with $40,000 in his pocket. The detainee said that three days after he entered Syria he was kidnapped by ISIS militants and imprisoned for seven months. 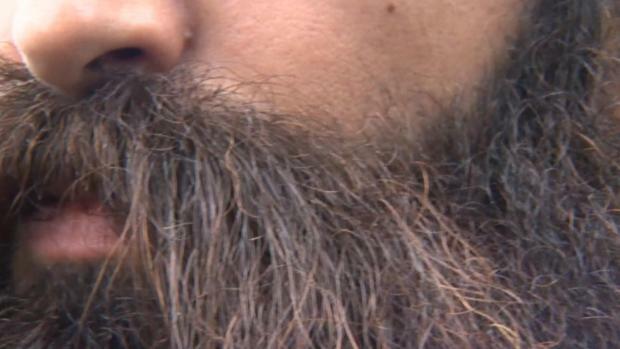 He said he was released only after agreeing to work for ISIS. He spent two months at an ISIS training camp near Mayadin, Syria, before being assigned to a brigade responsible for guarding the front lines in Deir el-Zour province. He then worked getting fuel for ISIS vehicles, handling brigade expenses and guarding a gate of an oil field. He left the oil field without permission one day and was apprehended by ISIS military police. After another stay in ISIS detention, he worked for ISIS monitoring imams and prayer callers and civilians running heavy equipment. When he was captured at a checkpoint, he told the American-backed SDF forces that he was "daesh" — another name for ISIS — and said "he wanted to turn himself in and speak to the Americans." When he surrendered, he was carrying the thumb drives, $4,210, a global positioning device, hats, clothes, a Quran and a scuba snorkel and mask.